As we send in few text messages now and then, we might not realize this, but we tend to use emojis more often than not. Now they are entering the world of marketing – as even subject lines of trendy product pitches consist of emojis, and nowadays you can even order a large pizza from Domino’s by simply texting them a pizza emoji! Emojis are soon touted to be essential. They are also said to be successful in email marketing campaigns, and business owners have effectively used them with varying degrees of success. Emojis have seeped into online communication, as nearly 6 billion of them are sent between mobile users, every single day worldwide. They save on time, to express emotions and add some charm to the monotonous text conversation. Even brands have now taken them seriously in messages and campaigns. According to an analysis of top 500 brands initiated by Socialbakers, about 59 percent of the brands included emojis in tweets and about 40 percent included them in Facebook posts. An Appboy study found that there has been a staggering 777 percent rise in the use of emojis in branded campaigns. About 92 percent of the online population has ventured to use them in daily conversations and hence brands are using them more seriously. To add to the above stats, more than 30% of online population use emojis multiple times a day, according to an Emoji Research Team report. Many forward–thinking companies hence have initiated campaigns that use emojis creatively, adding to the coolness factor in their pitches. Twitter recorded that use of emojis resulted in about 25% more engagement than before. Facebook recorded that emojis pushed the likes to more than 57% and 33% more comments and shares. Instagram posts now have 50% of comments and captions filled with emojis. Vyv Evans, a linguistics professor has termed emojis to be the fastest growing form of language in all history while Oxford Dictionaries had emoji as the Word of the Year 2015! Now that you know why emojis are useful, here are some tips to help you use them efficiently and effectively in marketing campaigns and take them to the next level. Emojis are simply used to convey a sentiment that cannot be expressed within a word or two. For example, “☺” would always convey “happiness” but it would be clunky if it is put in words “I am happy because of your post.” Simply posting the happiness emoji would convey a clear meaning. 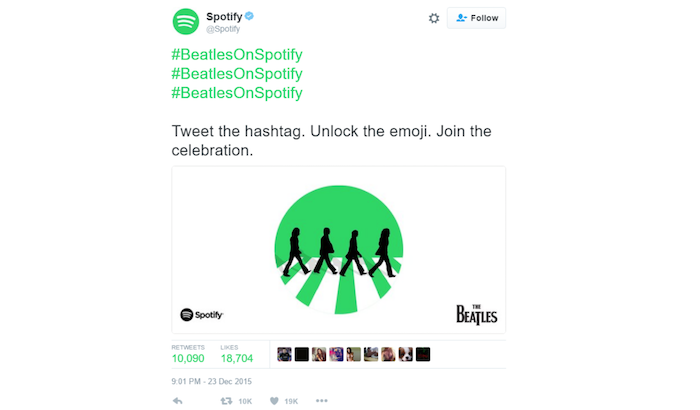 It is essential to use emojis organically and do not force them into a campaign . When managers become too creative, it might mirror the problem faced by the 2015 Chevy Goes Emoji campaign that welcomed the new 2016 Cruze. 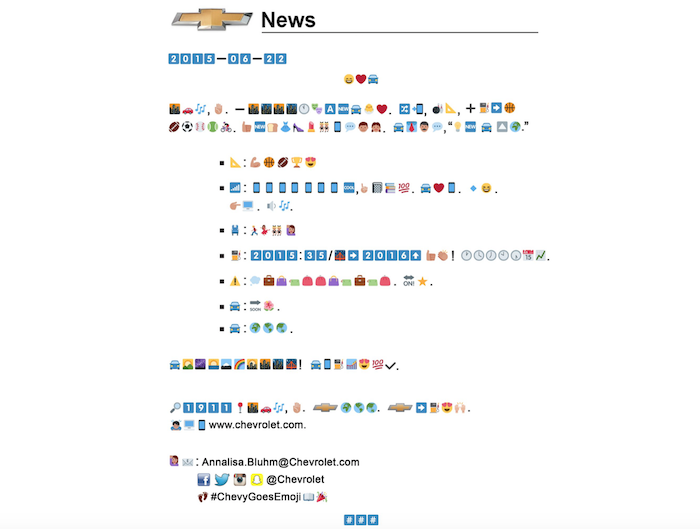 Chevrolet released a number of emoji-themed ads as part of the campaign, with a press release written only in emoji! The emoji ad series did result in better engagement on Twitter and nearly 21.7 million views on diverse paid social channels. But the responses were starkly negative on most counts. Although the viewership has increased 100,000 times, the “dislikes” have grown 5 times more than “likes” proving that not all attention is worth it. Lack of an organic flow with respect to emojis proved to be a failure on Chevy’s part for both the campaigns. With multiple emojis available in the social sphere, one needs to understand the meaning of the emojis and just not start using them randomly without a strategy. One needs to make sure the strategy is aligned with your audience. For example, a company targeting younger market might use edgy emojis in the subject line to grab attention. 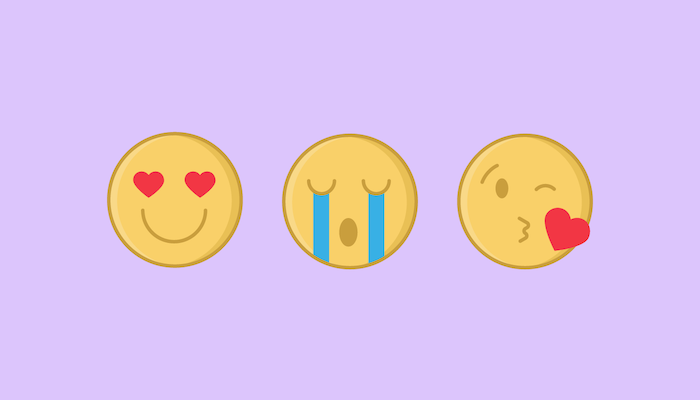 Emojis can foster real-time engagement by showcasing each of the companies and their human side too. Use emojis on social media as appropriate and get as creative as possible for increased success. The top brands including Coca Cola to Burger King, IKEA and many more now have their own branded emojis. 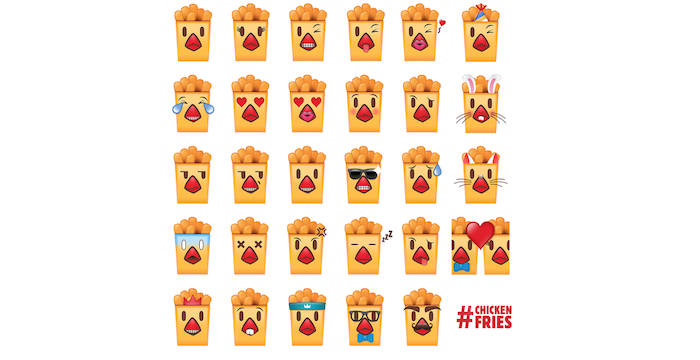 Burger King created its own custom Chicken Fries emojis to celebrate its offerings. Digiday reveals that more than 250 brands released their own emoji keyboards in 2016. But it is to be understood by brands that emojis approved by the Unicode Consortium will be available by default for smartphone users. Users can download a new keyboard, but it is a huge barrier and not worthy of effort for many. However, brands can get emojis usable on the common keyboard. Taco Bell even applied for a Change.org petition that secured 30,000 signatures asking Unicode Consortium for getting a taco emoji to the approved existing set. Such moves can get any brand a lot of attention, and even boost brand presence across the board, driving lot of user engagement in the bargain. Emojis can help a brand become more personalized in its marketing approach although not all ploys work for all sorts of brands. Even companies within one industry cannot bank on the emojis to work for them although if planned well, they can become a natural extension of their brand’s voice. Before using the emojis for a more personal approach, one should assess whether the emojis are relevant to the brand. The frequency of using emojis also needs to be ascertained beforehand and a balanced take whether the strategy could improve the message the brand needs to convey to its audience. Going overboard with the strategy like Chevrolet did, can only lead to huge losses and minimal returns. Using too many emojis for conveying their message destroyed their communication channel, putting customers off in the bargain. It is also disrespectful to treat the target audience in this manner, as it makes the brand look judgmental and one-dimensional in its approach. McDonald devised an email marketing campaign that went in the lines, which conveyed through emojis on a traffic block to stop and have food at McDonald’s. But it went viral for all wrong reasons as an artist depicted a vomiting smiley indicating that the food is not so great for consumption. The ploy eventually backfired. Emoji marketing is a dicey tool that brands need to think about twice before using as part of marketing campaigns. They are effective but one needs to know one’s audience and respect them through the message, and incorporate emojis smartly in the campaigns effectively. The relevance of the ad is important and the timely use of emojis will be admired by millennials, but do not pander to them in similar currency or else your brand might just get trolled. 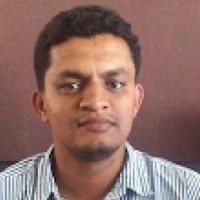 Juned Ghanchi is the CMO & Co-Founder of IndianAppDeveloper, which have skilled and experience team of app developers India, who provides professional mobile solutions.